It really is time to wake up to the reality of increasing coal consumption and carbon emissions. This was recently addressed by Maria van der Hoeven of the IEA who gave a speech to launch the “Medium Term Coal Market Report 2013” in Paris last Monday 16th Dec. Much the same points have also made by Dieter Helm in his book “The Carbon Crunch”. Coal is abundant and geopolitically secure. Coal-fired plants are easily integrated into existing power systems. No fuel draws the same ire, particularly for its polluting qualities both locally and in terms of greenhouse gas emissions. And yet no fuel is as responsible for powering the economic growth that has pulled billions out of poverty in the past decades. Over the next six years, additional coal production capacity of a half million tonnes per annum will be added worldwide each and every day. Coal prices are also falling. Coal price in ASIA is $4/mBTU whereas LNG prices are $16/mBTU – 400% higher. Indonesia has vast coal reserves. 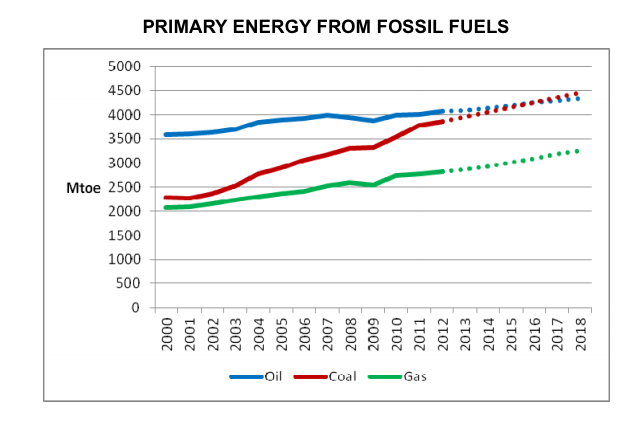 More than 60% of the rise in CO2 emissions since 2000 is due to burning of coal to produce electricity and heat. This rise in emissions is occurring in ASEAN countries. In China, the scale of coal in the economy is simply incomparable to fuels elsewhere. Replacing coal with gas in Chinese power generation would require twice the volume of all global LNG trade. Coal therefore will continue to play an important role in economic growth and energy security worldwide. 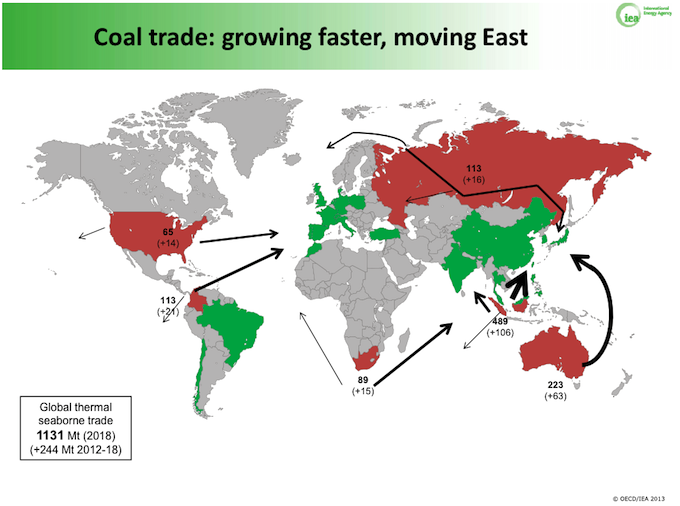 Rapid Rise of Coal in ASIA – so far mainly from China. ROW =Rest of the World. If just the new coal plants under development in India and Indonesia were instead to be completed using latest technology it would save as much CO2 as all the wind turbines in Europe combined. Technical subsidies by Europe to achieve this would be a far cheaper means to tackle climate change than are current policies. International carbon price. This needs to make coal artificially 3 times more expensive than it actually is to encourage a switch to gas. I don’t think there is a hope in hell of getting developing countries to agree to that – and anyway who would be the recipient of these trillions of dollars ? Underground gasification of coal to methane. This could halve carbon emissions and avoid air pollution but at the expense of lower yields. Only an international agreement similar to banning the use of CFCs would achieve this. 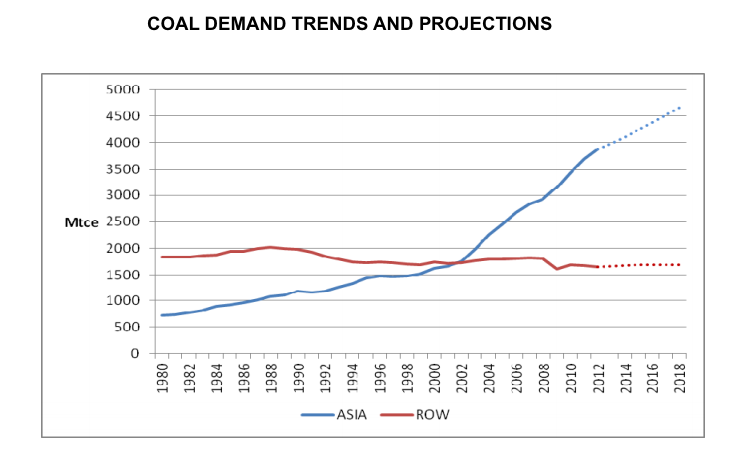 The scale of the growth in coal consumption in Asia is staggering. It really makes a mockery of Europe’s de-carbonization policies. For energy security reasons the UK should have built a couple of modern efficient coal plants just like Germany and Holland did within EU limits and thereby save on energy bills. However, Friends of the Earth stopped the Kingsnorth plant in Kent from being developed by E-on in 2009, and shortly after the UK government essentially blocked any new coal plants without CCS and introduced a stealth carbon floor tax penalizing coal further. Meanwhile any progress on CCS is essentially stalled and the UK faces power curs in 2014/2015. One reason for that is that 30-40% of the output power is needed to drive CCS ! 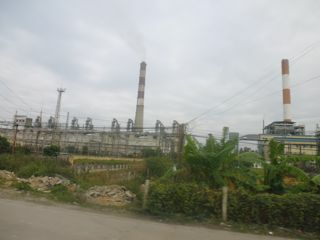 An old coal power station outside Hanoi. Vietnam and Cambodia are self sufficient in coal and also export to China. Cambodia also has large oil reserves. Acknowledgement: The figures and data are taken from the IEA talk of Maria van der Hoeven. This entry was posted in coal, Energy, Science, Technology and tagged AGW, Coal, Energy. Bookmark the permalink. There is no problem with adding more CO2 tot the Atmosphere, it just makes the plants grow quicker & bigger. All things being equal doubling CO2 in the atmosphere would cause a 1C rise in surface temperatures. This is fairly straightforward physics. However, what happens in reality is still unsure and possibly clouds are a negative feedback. In any case a 1C rise in temperatures would probably be beneficial and the extra CO2 encourages plant growth. You need to accept extreme feedback scenarios from models to get anything ‘dangerous’. The data does not support these extremes. According to this study by Richard Tol the economic impacts of global warming are positive if the warming stays below 2C. “This is fairly straightforward physics” – No it isn’t, it’s physically impossible. CO2 has never been proven to raise temperatures. It does the opposite. Plus, no gas can “trap” heat, that is physically impossible. To say that a “doubling of CO2 will raise the temperature” is incorrect. Are you sure about the 1C rise overall? See the section by Marty Mlynczak about CO2 cooling the Thermosphere. The point is that they have evidence and proof of the Cooling, but none for the warming by CO2 lower down, only the greenhouse gas theory. I have read your interesting post “Coal-The hard facts”. quantity, electricity generating cost and safety problem. I would like to have your comments on my ideas. Currently in Asia coal is the cheapest fuel. Germany is building 9 new modern coal stations which limit pollution and reduce CO2 emissions within EU regulations. Clean coal and gas (even with CCS) make sense in Japan short term but can only be intermediate solutions for the next 100 years or so. Climate change may not turn out to be a big problem but eventually fossil fuels will become scarce so we should prepare alternatives. Renewables will never work in Japan, so new generation nuclear still makes a lot of sense. The Fukushima nuclear disaster was a chain of linked mistakes. If only the emergency generators had been put on the roof everything would have been all right. This is no reason to reject nuclear “per se” as I can’t see any other long term alternative. I would reopen existing nuclear plants as soon as possible following safety checks and transfer funds away from renewables to research alternative nuclear. We have time to get it right and should reject alarmist claims to de-carbonise now, because they lead to pre-industrial lifestyles. You say “even with CCS” , but wouldn’t it be better still to skip the CCS and not waste precious fuel resources in futile pumping, redirect that investment to better use, and let the CO2 feed enhanced forest growth and crop growth ? Yes Bob – we could build huge greenhouses next to coal stations and simply pump the CO2 there to dramatically increase crop yields ! I don’t think all those green environmentalists would be too happy though. They are determined to return to the garden of Eden.